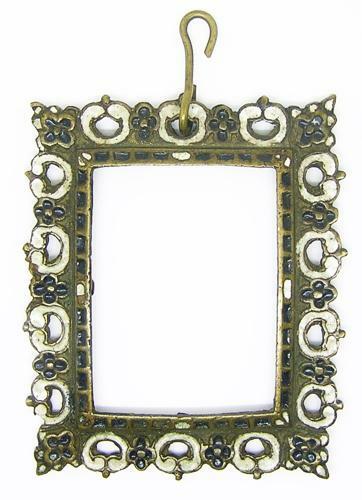 This is a nice Tudor enameled frame, dating to the 16th - 17th century. The frame is of the type used to house early portrait miniatures of King Henry VIII (see the last photograph in the Fitzwilliam Museum- dated 1525 - 1527). This example is set with black and white enamel. It retains three out of the four original securing tabs, with a 'make-do' suspension hook. Such frames were also used to contain reliquaries and embroideries. A nice historic piece with a good patina.